First post here looking for some advice. I bought a 2003 Boxster S with 26k miles last Spring. I've put about 10k miles on it to date and had an awesome time. Unfortunately last week I got backed into low-speed while in a parking lot. I took what appears to be cosmetic damage to my left fender and bumper. There is a clear dent. I drive the car 40 miles home, so it otherwise seems to be in good shape. I've never been in an accident or dealt with the process of insurance before. I had a police report filed, which I picked up today. It confirms the other driver was at fault. I called my insurance company day-of to get things started. From what I gather I shouldn't have to pay anything? In terms of repairs, would anyone recommend going through a Porsche dealer vs. private shop? I called the local Porsche place, but they said they send their cars away to another company in PA (I'm in NJ). For regular maintenance I take take my cars to an independent mechanic with much better rates. Is Porsche likely to be over the rates insurance will pay for? I haven't gotten any quotes yet. I don't have a ton of free time. Relax. Your ins co will handle the hassle. If it was the other driver's fault and they have ins, you should not have to pay. Where exactly are you located? Someone from the area will probably have a good suggestion for you to have your car repaired. Good luck. Everything will be fine. Thanks for the reassurance. Just trying to figure out how to get her to as close to pre-accident condition as possible. It's kind of crazy how fast I've gone so many times, then someone just bumps into me at the worst place. Ask the insurance company who they use but also investigate the reputation of the P-car dealer recommendation. Since the wheel was hit, you may need both body work and suspension work which may involve the dealer. The body will be the easy part. But get an inspection for suspension component damage including mounts for the engine and rear axle. Even the half shafts. Certainly a wheel repair. So to get the car back in shape, you may have to deal with three different shops. Been there, one totaled, one repaired good as new and better than when I bought it. I just got my '03 S on the road. Its my first time I have driven a Boxster. I have to say parking lots are a DANGER to these little, low cars. They scare the heck out of me so I have been trying to avoid them. If I do find myself in one, I take the same approach as a motorcycle rider and assume everyone is out to cream me. Any damage to the roof? No damage except to the fender and bumper. 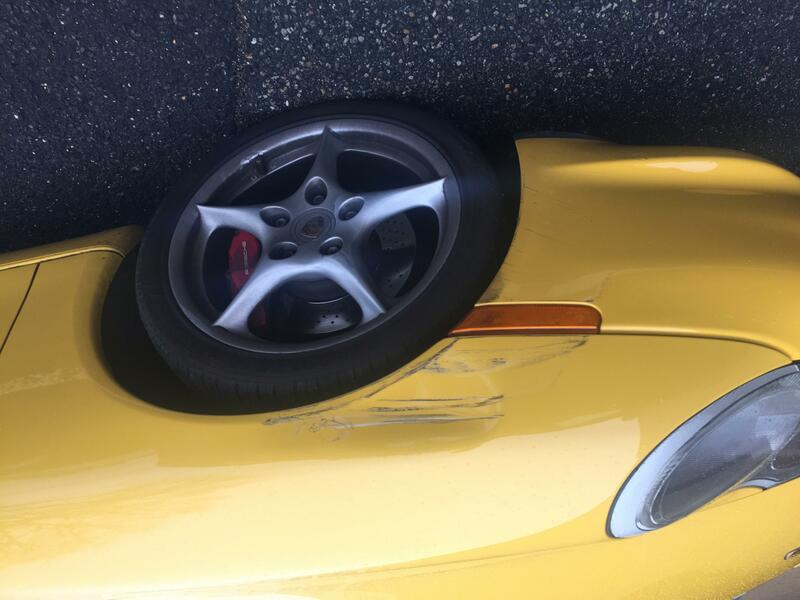 Anyone have experience /recs on getting something like this fixed via Porsche? Unfortunately got a call from insurance today and the other driver's coverage was lapsed, so it looks like I'll be out $500 for uninsured motorist deductible, which they may be able to recover or I could do small claims. Not a cheap trip to Taco Bell.